The little ones will just love this "just right size" Blanky to carry everywhere. 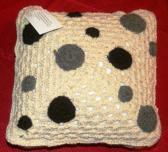 Hand crocheted with 100% North Carolina alpaca fiber from LHA Barry. It is a very soft pale fawn color. 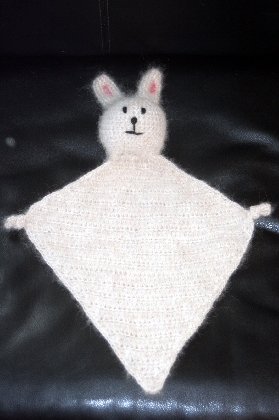 Measures approximately 18 1/2 inches from bottom tip to rabbit ear tip and 13 1/2 inches from left paw to right paw tip. 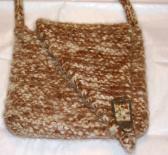 This is made of a natural color from natural fiber. Alpaca is also fire resistant after scientific tests.